Scott was happy with his first Tarpon! Tom and Scott had one heck of a Tarpon morning jumping at least 15 and catching 5. 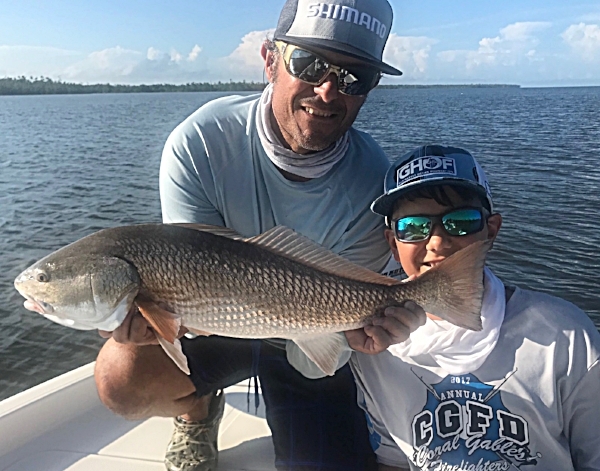 Throw in some Snook, a Redfish and a bunch of Trout for a Grand Slam and back at the dock by 1 pm. Pete's Tarpon on a Twitch n Rap! Pete Post and his buddy had a nice day of Tarpon and Snook. 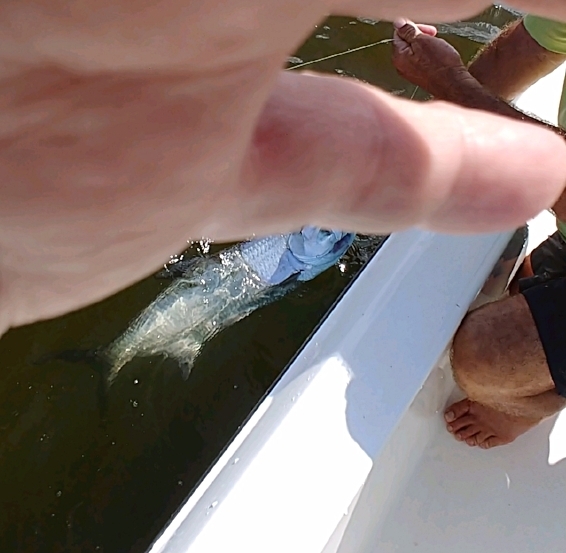 The fingers in the way of Pete's best Tarpon picture but caught the big Snook jumping. Thompson family had a nice day of Tarpon, Snook, Trout Jacks and Sharks . Little Colt caught that big Snook all by himself. Fishing has been fun for the last couple weeks with happy Tarpon and plenty of Snook. This past weekend 9-6 thru 9-9 we got some N.W. to S.W. winds and it affected the fish. We caught fish every day but worked for every one. Its that time of year where storms are somewhere off of Florida's coast line and sometimes it helps and sometimes it don't. The next 2 months can be incredible the Tarpon are thick and should stay around until first cold front. Snook are here in good numbers and I'm catching some Redfish. The positive is there's been plenty of bait around and the quality fish aren't far behind. Its a good time to get the kids and family out, the temps aren't up in the 90's all day. If you are interested in a fun day of fishing give me a call at 305 333 8149. Its almost time for the "Mullet Run" to start there is no more fun than watching them get blown out of the water. Stayed tuned for info on that. Newer PostIt's Mullet run time! Older PostWe are "Slammin em"